This book is my first exposure to Wanda Dyson’s writing and it didn’t let me down. 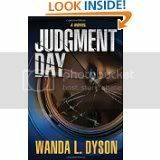 It is a mystery thriller with a light touch of romance and a hint of Christian morals. The lead character, Suzanne Kidwell, is a highly-rated, though hardly highly regarded, TV anchor that reports on sensational news stories but doesn’t necessarily verify her information. Her life and career take some serious twists and turns when 1) her boyfriend is killed in a car bomb explosion while driving her vehicle; 2) several young people turn up missing; 3) she comes home to find a seriously injured man on her floor, he later dies, she finds herself waking next to the body, and she is blamed for the murder. Her only chance of clearing herself is to take her attorney’s advice and hire the two top private investigators – one of which happens to be her ex-fiancé. The tension builds as the mysteries unfold and run together in a deadly mix of murder and black market activity. I felt the characters could have been developed better, but I enjoyed them nevertheless. The Christian aspect was so minimal as to be barely noticeable. I think the author missed an opportunity to develop the moral theme and the chance for Suzanne to find faith at the end. She started to lead up to that, but never finished the task. I rate this book a 4/5 because it kept me up all of one night and part of the next as I raced through it, unable to put it down except to get some much-needed sleep! I love a good thriller and this had enough surprises and took some unexpected avenues that kept me guessing, not so much as to who was the bad guy, but what exactly his crime was!